Organizers: Malgorzata Peszynska, Ralph E. Showalter. This is the archive of AMC seminar. 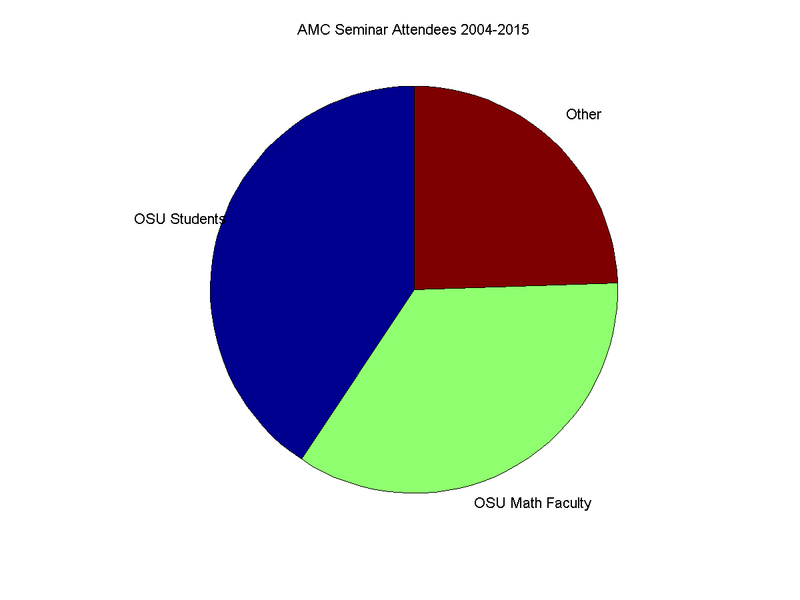 The AMC seminar is devoted to general topics in applied mathematics and computation. We welcome an interdisciplinary audience and speakers: faculty, researchers, and graduate students from mathematics, geosciences, computer science, engineering, atmospheric sciences, and other disciplines, to attend and present research talks in their fields as well as reaching across multiple fields. Both technical, tutorial, and expository presentations are welcome. 2019-02-15 12:00 STAG 110 Applied Mathematics and Computation Seminar Malgorzata Peszynska Approximation of scalar conservation law with hysteresis. Part I. 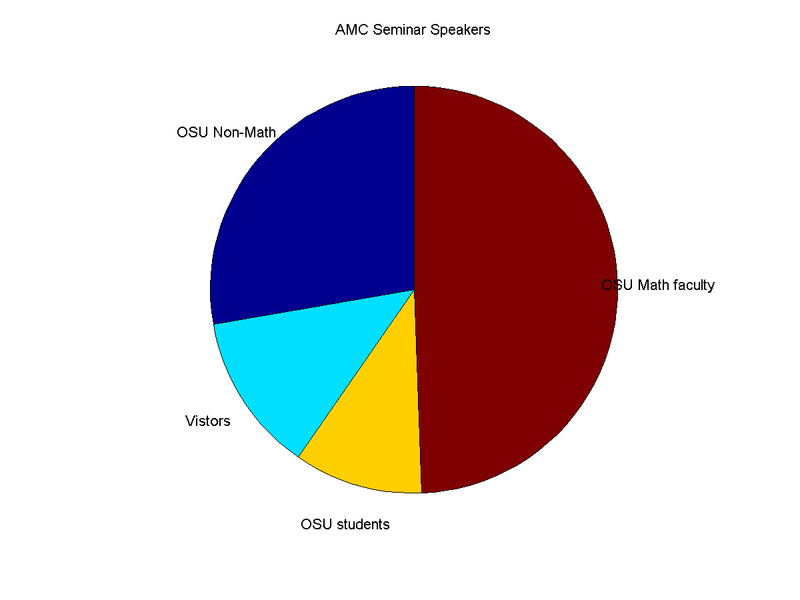 2018-09-21 12:00 STAG 160 Applied Mathematics and Computation Seminar No meeting today. 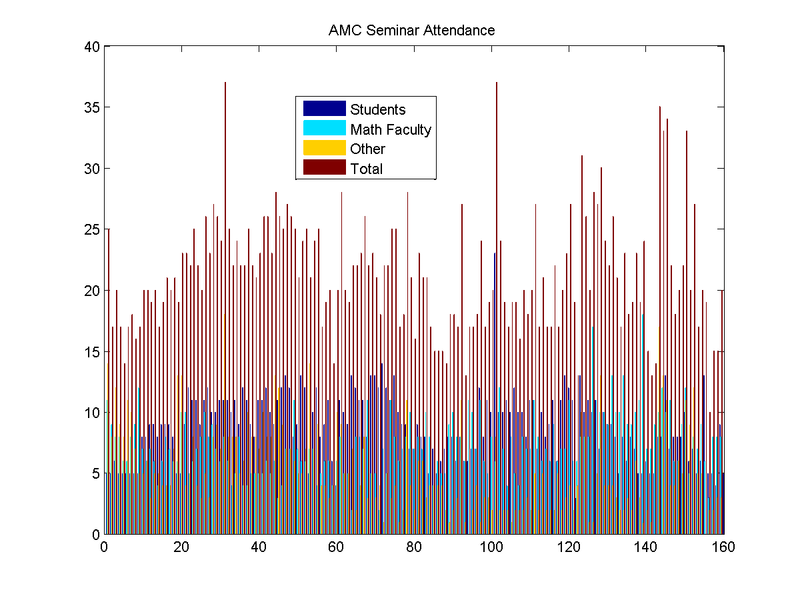 But, some Big AMCS Data! 2017-10-27 12:00 Applied Mathematics and Computation Seminar No meeting today. Please attend SIAM PNW conference instead. 2017-10-06 12:00 STAG 260 Applied Mathematics and Computation Seminar Diana Gonzalez and Joseph Umhoefer Summer internship at LBNL: what and how it went. 2016-05-13 12:00 GLK 113 Applied Mathematics and Computation Seminar Radu Dascaliuc When does Reynolds number fail to predict turbulence? 2015-03-12 16:00 Joyce Powell Leadership Room, Memorial Union Applied Mathematics and Computation Seminar Juan M. Restrepo The 10th Edwards lecture "Taking Uncertainties into Account in Geosciences, Physics, and Engineering"
2015-01-16 12:00 KEAR 112 Applied Mathematics and Computation Seminar Ralph E. Showalter Mathematical modeling of mechanics and geomechanics II. 2015-01-09 12:00 KEAR 112 Applied Mathematics and Computation Seminar Ralph E. Showalter Mathematical modeling of mechanics and geomechanics I. 2014-10-06 12:00 Owen 106 Applied Mathematics and Computation Seminar Masa Prodanovic Level set modeling of percolation, pore geometry and physical properties of texturally equilibrated materials! 2014-06-06 05:00 GLK 115 Applied Mathematics and Computation Seminar No seminar today. 2014-01-17 04:00 Applied Mathematics and Computation Seminar Brian Kirby Please attend Edwards Lecture this afternoon on "Geometrically Enhanced Differential Immunocapture: Using obstacle arrays in microfluidic devices to enhance efficient and pure rare cell capture from fluid suspensions"
2013-11-08 04:00 GLK 115 Applied Mathematics and Computation Seminar Malgorzata Peszynska Memory=subscale diffusion. Numerical approximation. 2013-05-03 05:00 GLK 104 Applied Mathematics and Computation Seminar Belinda Batten Ocean Energy Technologies: the Wave of the Future? 2012-02-24 04:00 GLK 113 Applied Mathematics and Computation Seminar Enrique A. Thomann Large scale effect of discontinuities in diffusion equations. 2011-10-28 05:00 GLK 113 Applied Mathematics and Computation Seminar Nathan L. Gibson Gradient-based Methods for Optimization. Part II. 2011-10-21 05:00 GLK 113 Applied Mathematics and Computation Seminar Nathan L. Gibson Gradient-based Methods for Optimization. Part I. 2011-06-03 05:00 GLK 113 Applied Mathematics and Computation Seminar No meeting today. See you all next Fall !!! 2009-02-06 04:00 Gilkey 113 Applied Mathematics and Computation Seminar John Selker Trying to be a thousand times smarter with large scale simulations: local mesh methods of sub-grid scale parameter estimation. 2008-02-15 04:00 Gilkey 113 Applied Mathematics and Computation Seminar Rubin Landau Computational Physics, An Improved Path for Physics Education? 2007-11-09 04:00 Gilkey 113 Applied Mathematics and Computation Seminar Nathan L. Gibson Gradient-based Methods for Optimization. Part II. 2007-11-02 05:00 Gilkey 113 Applied Mathematics and Computation Seminar Nathan L. Gibson Gradient-based Methods for Optimization. Part I. 2006-06-09 05:00 Gilkey 104 Applied Mathematics and Computation Seminar Kyle Augustson and Malgorzata Peszynska Pore-scale simulations with a vorticity-stream function solver for Navier-Stokes equations. 2006-01-13 04:00 Gilkey 113 Applied Mathematics and Computation Seminar Malgorzata Peszynska Lagrange multipliers and discrete LBB condition in mixed methods for Darcy and Stokes flow. Part II. 2005-12-02 04:00 Gilkey 113 Applied Mathematics and Computation Seminar Malgorzata Peszynska Lagrange multipliers and discrete LBB condition in mixed methods for Darcy and Stokes flow. Part I. 2005-04-29 05:00 Gilkey 115 Applied Mathematics and Computation Seminar Malgorzata Peszynska Primer on domain decomposition methods for flow and transport. 2004-11-08 04:00 Gilkey 113 Applied Mathematics and Computation Seminar Lynn Bennethum What Can We Learn From Compressibility Experiments?